Super Eagles coach Sunday Oliseh hails Moses Simon for his firm performance as AA Gent his clubside held Olympique Lyon 1-1 in the Uefa Champions league on Wednesday. “Glad to see Moses Simon start for Gent as they take on Lyon in the Champions league. A good week for our super Eagles players so far,” Oliseh tweeted. Former Nigeria U20 coach Manu Garba has been appointed coach of NPFL side Giwa FC, according to a statement by the club. This comes a day after former coach Aminu Musa resigned due to family engagements as reported. 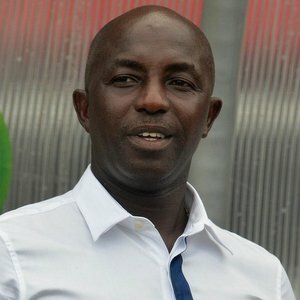 Nigeria’s Under-23 team head coach, Samson Siasia has blamed carelessness and wastefulness for his side semifinals 1-3 loss to Burkina Faso at the ongoing All Africa Games in Brazzaville, Congo. “I never imagined losing to Burkina Faso but then my midfielders played so well, my defenders and attackers let me down. Can you imagine my attackers not being able to convert about eight chances that came their way? “To make matters worse the defenders were asleep on a day they should have been up and doing. “Who told the central defenders to keep offside trap the way they did? I am totally disappointed. “We can’t play like this in Senegal and expect to qualify for the 2016 Olympics. No way! “We were so bad that anytime the ball beat the defenders even my goalkeeper could not stop any of the shots fired at him. The League Management Company (LMC) has turned down a plea for leniency by Sunshine Stars and the captain, Sunday Abe on the Summary Jurisdiction notice issued to them following incidences of the Match Day 28 fixture against Shooting Stars in Ibadan. “It would suffice to state that all the established facts and circumstances regarding the match-day incident and the Rule Book were considered in arriving at a decision, including the respective sanctions”, the LMC wrote in reply to Sunshine Stars management. Arsenal manager Arsene Wenger says striker Olivier Giroud’s red card during their 2-1 defeat by Dinamo Zagreb was “harsh”. Giroud was sent off in the 40th minute of the Gunners’ Champions League opener on Wednesday after picking up two bookings. , after they impressed in the win over Newcastle. ” We knew the first 10 fixtures would be very challenging, sometimes you get that with the draw of the fixture list, we found out a lot about ourselves. Arsenal could make a January bid for Real Madrid playmaker Isco… and he could come at a bargain price. The Spaniard only has two years left on his contract and Arsene Wenger is a huge fan of the former Malaga star. Jurgen Klopp wants to find out if he has any chance of landing the Bayern Munich job before considering a move to the Premier League. The former Dortmund boss would prefer to succeed Pep Guardiola at the Allianz should he leave. Manchester United are preparing a January swoop for Leeds United defender Charlie Taylor after Luke Shaw was ruled out for the season. Louis van Gaal has sent scouts to watch the 21-year-old, who has impressed this season.